Community School soccer players and their fans tasted the excitement of victory last Thursday at Sagewillow Farms and looked ahead with great anticipation to the prospect of state tournament action in Caldwell starting this Thursday. 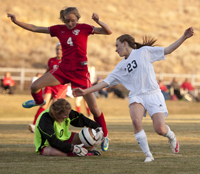 The top-seeded and unbeaten Cutthroat girls nailed down their fifth consecutive High Desert Soccer Conference tournament championship with a resounding 6-1 triumph over the No. 2-seeded Filer Wildcats. And, on a brilliant fall day at Browning Field, the No. 3-seeded Cutthroat boys held off the No. 4-seeded Buhl Tribe by a 3-2 score in the HDSC third-place game and also advanced to the State 3A meet Oct. 24-26 at Vallivue High in Caldwell. Community School senior striker Hannah Dies (102 career goals), the only small-school All-State girls’ soccer player last year, scored two goals Thursday to become the all-time single-season goal scoring leader in Cutthroat annals with 31 goals. Coach Kelly Feldman’s Cutthroats improved to 15-0-0 with a terrific offensive show by the seniors in their home farewell. The Cutthroats out-shot the Wildcats 11-6 in the first half and built a 4-0 halftime cushion. Filer played physically, but seniors Katie Feldman and Fitzgerald controlled the midfield and the Cutthroats had too much speed and depth for the Wildcats. Engelmann started the first scoring play with a pass to sophomore Lilly Jenner, who chipped the ball to Murach for a 1-0 lead at 12 minutes. Despite close man-marking by Filer’s Taylor Sharp, Dies escaped for her first goal on a loose ball at 29 minutes, after a cross from Emily Siegel. Fitzgerald’s quickly-executed free kick from just outside the box caught Filer flat-footed at 38 minutes for a 3-0 lead—Fitzgerald’s 11th goal of the season and 32nd of her career. Katie Feldman’s fourth goal of the season and 20th of her four-year career came in the 39th minute, after another Fitzgerald free kick gave Filer fits. Feldman teed up a 25-yard shot. Dies and Englemann (6 goals season, 26 career) scored in the second half, while sophomore Ruby Gomez scored for coach Shane Hild’s Wildcats (12-4-1). The Cutthroat defense led by Hennessy, Sydney Hagenbuch, Sara Runkel, Siegel and Kate Rathfon held high-scoring Wildcat senior striker Darby Robertson without a goal, despite many solid attacks on Cutthroat goalkeeper Olivia Ott. Community School sophomore Tom Gillespie took a pass from freshman Johnny Blackburn and hit the top corner of the Buhl net in the 51st minute Thursday for a 3-1 Cutthroat lead in the all-important HDSC third-place battle. That goal held up under relentless Buhl pressure on Cutthroat senior goalkeeper Reed Roudabush and the Sun Valley boys carried away a 3-2 victory improving their record to 13-4-2. Buhl ended its season 7-7-3. Other goal scorers for the home team were sophomore Jay Fitzgerald (23 goals season) and Blackburn (9 goals). Coach Richard Whitelaw’s “Men of the Match” were Blackburn and freshman Dehner Figge, who played so well on the left flank. Whitelaw said, “What a super effort tonight by the Cutthroats! Deserved winners, and the lads played with a lot of heart and pride.” Meanwhile, the top-seeded Gooding Senators (11-1-2) won the HDSC championship 4-2 over No. 2-seeded Wendell (11-3-1).